watch the size! I found the larger machines did not fit into the space. had to buy a smaller one. Size of the washing machine is not so much of an issue for me just put it on multiple times. It's drying that is the issue. Seems a bargain - looks like it's a discontinued model. But you can't complain for £126. This is not the good old Japanese Sharp.it’s just their brand name Vestel from Turkey (or another rubbish company of China) “rented”. At that price, buy two..= 12kg load. 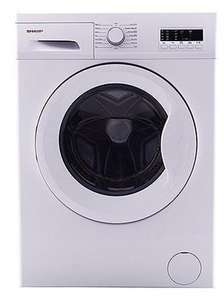 They don't seem too bad that's for sure and a new washing machine for £150 or less is nuts really. If it does a few years then dies it's not the end of the world and if it lasts longer it's a bonus. Some supposed premium brands don't necessarily last that long.